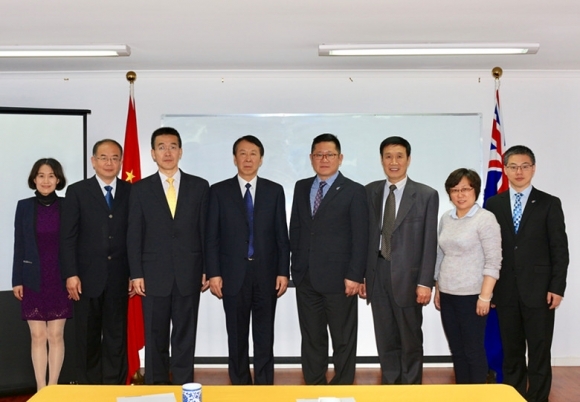 At the invitation of the Australian Education Management Group, the delegation of Shandong University of Science and Technology visited Swinburne University of Technology from 6th May to 9th May, under the leadership of Professor REN Yanqi, President of Shandong University of Science and Technology. On 7th May, the delegation visit AEMG Melbourne headquarters. They were welcomed by Mr. Roger LI, the CEO of AEMG, Mrs. Jenny WANG, the General Director of AEMG, and other AEMG staff. During the meeting, the two parties had a detailed consultation about the ongoing joint research programs and reached a broad consensus with regards of cooperation in the future. On 8th May, CEO Mr. LI Xinqing, Director General Mrs. WANG Jing from AEMG accompanied the delegation to visit Swinburne University of Technology. Prof. Linda Kristjanson, Vice Chancellor and President of Swinburne University of Technology, Prof. Duncan Bentley, Deputy Pro Vice Chancellor, they host and met the delegation of Shandong University of Science and Technology. During the meeting, the two parties had a detailed consultation on the cooperation and reached a broad consensus. The delegation not only visited part of the university’s teaching and research laboratory, but also listen to the relevant laboratory introduce. The visit further enhanced the communication between AEMG and its partner universities, and ensured a smooth and efficient operation of joint education programs.